We’d love your help. Let us know what’s wrong with this preview of The Imposter Bride by Nancy Richler. To ask other readers questions about The Imposter Bride, please sign up. Were you sympathetic towards Lily ? I have to admit, I was quite surprised and a little disappointed at the amount of negative reviews of The Imposter Bride I have come across. Incidentally, they all seemed to have one thing in common: they almost unanimously agreed the book was too dull. If you are interested in this book because for I have to admit, I was quite surprised and a little disappointed at the amount of negative reviews of The Imposter Bride I have come across. Incidentally, they all seemed to have one thing in common: they almost unanimously agreed the book was too dull. If you are interested in this book because for some reason you were led to believe this is a “fun, fast-paced action novel of mistaken identity”, do not read it. This book is less like a roller coaster ride, and more like a swinging pendulum. It is charming without being witty, mysterious without being thrilling. There is an almost calming effect in reading The Imposter Bride. The story develops softly, the characters slowly unraveling before the reader’s eyes. Since the plot is narrated by several characters, the layers peel off intermittently and rather unhurriedly. You will follow several stories all at once, each building up to one little girl’s introspective discovery. This is one of those books that makes me wonder what the publishing companies are really thinking. I’ve read many self-published titles that are much, much better than this book, so what’s the deal? The main problem is that the book is so dull. I kept hoping for it to pick up, for some of the pieces to click together, but it just droned on, as if the writer had to reach a particular word count. None of the characters leave any kind of mark in the reader; they are all superficially written and com This is one of those books that makes me wonder what the publishing companies are really thinking. I’ve read many self-published titles that are much, much better than this book, so what’s the deal? The main problem is that the book is so dull. I kept hoping for it to pick up, for some of the pieces to click together, but it just droned on, as if the writer had to reach a particular word count. None of the characters leave any kind of mark in the reader; they are all superficially written and completely interchangeable. Apart from that, the plot is a convoluted mess that is never cleared up. There is so much left unanswered, as if the author just ran out of time and said “screw it, they’ll get it”. Well, no, we don’t get it. What about the stones that Ruth keeps getting? What is the symbolism of those? Why did her mother leave her, really? There is just a lot that we’re supposed to take on faith and it just doesn’t work. This book needed a major overhaul, a complete rewrite so that the readers don’t fall asleep halfway through a chapter. I can’t recommend this one. There’s so many more interesting books out there; try something else. I think Nancy Richler wanted to write a *good* book. *The Impostor Bride* dances around being good, but lacks rhythm and grace and so slouches awkwardly around the dance-floor, making it awkward for everyone reading, but the effort at goodness is altogether too sincere to turn away. The plot offers originality - a war-bride shows up in Canada, is scorned by her betrothed because he sees “something” amiss in her, she marries his brother, gives birth, abandons the child and runs away. We learn ove I think Nancy Richler wanted to write a *good* book. *The Impostor Bride* dances around being good, but lacks rhythm and grace and so slouches awkwardly around the dance-floor, making it awkward for everyone reading, but the effort at goodness is altogether too sincere to turn away. The plot offers originality - a war-bride shows up in Canada, is scorned by her betrothed because he sees “something” amiss in her, she marries his brother, gives birth, abandons the child and runs away. We learn over the course of the novel the practical reasons for her abandonment (the titular “impostor”), and are meant, I think, to also contemplate the psychic and affective reasons she might also leave. The book makes a sincere attempt to point the finger at the (oft suggested “unspeakable”) atrocities of the Holocaust as being “too much” for the young bride, but without entering these events - or even shadows of them - into the plot *and* without offering Lily’s narrative point of view (even a third person limited would have gone a long way) these “unspeakable” reasons are left to the reader’s speculation and are not, as Richler might have hoped, compelling enough to justify the abandonment of a child. Indeed, our first person protagonist - the abandoned daughter - rightly points out that many of her peers have parents of this generation of “unspeakable” events who did not leave (even if they do exhibit erratic behaviour), so why did *her* mother leave? For this reason the plot events that supposedly explain the abandonment do not hold water. Nor does the eventual explanation of how members of her family knew, and didn’t tell her. Nor, too, the hastily and inexpertly constructed reunion scene (not a spoiler, I think, because the progression of the plot is such that it can *only* resolve in a reunion). A note on the reunion (as it particularly irked me as it’s the climax and the apparent justification for so much weaving in and out of time - we’re meant to get *here*): not only were the scenes rushed, especially when contrasted with the earlier scenes that explore in great length everything from depressed smoking to school yard bickering, but the explanation offered by Lily which is in effect the explanation of “I have no explanation,” would be fine, indeed, it would be complicated and profound, if we had Ruth *do* something with the explanation, think something about it, reflect on it, reject it, respond, react. Instead we witness the reunion, hear the paltry account of why she left, find no explanation of the mysterious rocks, hear nothing of Ruth’s reaction or thoughts. A plot climax without an attendant climax in character development or theme. And a frustrating plot climax at that because it doesn’t bring a satisfactory explanation (maybe because there isn’t one? not that there isn’t in the world, but because Richler hadn’t imagined what that could be?). This fine novel, set mostly in Montreal (with segments from Poland and from Thunder Bay,) is another on the short list for the 2012 Giller Prize in Canada. Unlike the other three novels on the list, this is a quiet and textured exploration of family interaction -- less dramatic and expansive than "Ru," or "419" or "Inside." "The Imposter Bride" is a reflective and introspective probing of the impact on a young woman of her mother's unexplained desertion shortly after her birth. There is a quiet This fine novel, set mostly in Montreal (with segments from Poland and from Thunder Bay,) is another on the short list for the 2012 Giller Prize in Canada. Unlike the other three novels on the list, this is a quiet and textured exploration of family interaction -- less dramatic and expansive than "Ru," or "419" or "Inside." "The Imposter Bride" is a reflective and introspective probing of the impact on a young woman of her mother's unexplained desertion shortly after her birth. There is a quiet depth and sensitivity to the writing, and a focus on time and place that makes this novel at once commonplace yet powerful. A Polish woman who calls herself Lily Azerov comes to Montreal after World War Two, marries into a family in the close-knit Jewish community there, gradually tries to escape from her war-time nightmares, and has a child, Ruth -- an all too common story in the post-Holocaust world. Then suddenly, stepping out to buy a bottle of milk, she departs, leaving her husband a note of apology. Why has she gone? How has this come to pass? And what are the results for her daughter and the family she leaves? This could be a drama, a story of suspense and danger -- yet Richler does something more interesting than that. She presents instead a careful dissection of how Ruth over the years grapples with what seems a profound rejection that turns her life toward a conformist effort to find affirmation in a conventional life. Ruth's story, in turn, gradually becomes the vehicle by which the enigma of Lily is ultimately unfolded -- and Lily's story comes to be seen in many respects as the antithesis of Ruth's. Lily's life, it becomes clear, is one of passion, of defying the odds, of survival despite immense dangers -- an unconventional life that she could not, it turned out, carry forward in the close family confines in Montreal. What are the implications of this juxtaposition of the two lives of mother and daughter? For me, that's a fascinating question. What does Ruth make of the life that Lily in the end reveals to her? How does Lily feel about the much safer world that Ruth has built for herself? With her skills and sensitivity, I wanted to see Richler confront these questions. But she does not. She writes her story, and she writes it well. But Ruth remains a character with depths that remain unexplored. There is a tension suggested with her husband, but this is not pursued in the book. Lily, too, remains an unfinished character for me -- never really addressing the reality of her daughter despite the insight we develop into why she left Montreal. I enjoyed this book and found the characters to be vividly written. Lily comes to Canada from Palestine to be married but her groom sees her at the train station and rejects her. His brother marries her and we learn that Lily Azerov is not who she claims to be, and soon after her daughter is born, she abandons her family. This abandonment hangs over her daughter’s life like a shroud. The story is told through different points of view and it’s very deep and personal for everyone in it. I also found I enjoyed this book and found the characters to be vividly written. Lily comes to Canada from Palestine to be married but her groom sees her at the train station and rejects her. His brother marries her and we learn that Lily Azerov is not who she claims to be, and soon after her daughter is born, she abandons her family. This abandonment hangs over her daughter’s life like a shroud. I also found the subtext of the story very interesting. There is a point in the book where Lily talks about being mistaken for someone named Gabi while in a coffee shop. The man calls out to her and as she turns around, sees his face fall. She doesn’t know who this Gabi is but she does know this man has lost her in the war and that for a minute, he had allowed himself to belief she was still alive. It was heartbreaking to read. So many people lost loved ones in the war; everyone bears the scars of that loss, including Lily. Ultimately, this story is about love, understanding and forgiveness. I enjoyed it. This review has been hidden because it contains spoilers. To view it, click here. 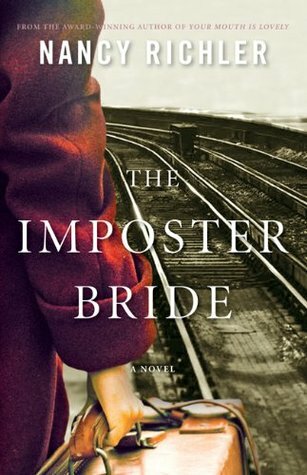 The Imposter Bride was shortlisted for the 2012 Scotiabank Giller Prize, Canada’s most distinguished literary prize for the best Canadian novel or short story collection published in English. I was thrilled, because I loved this book. The Second World War is over and in a small room beside a banquet hall, mail-order bride Lily Azerov sits on a couch with her new husband Nathan Kramer. She has come to Montreal from Poland, via Palestine. It was Nathan’s brother, Sol, who was supposed to marry Lil The Imposter Bride was shortlisted for the 2012 Scotiabank Giller Prize, Canada’s most distinguished literary prize for the best Canadian novel or short story collection published in English. I was thrilled, because I loved this book. The Second World War is over and in a small room beside a banquet hall, mail-order bride Lily Azerov sits on a couch with her new husband Nathan Kramer. She has come to Montreal from Poland, via Palestine. It was Nathan’s brother, Sol, who was supposed to marry Lily. Sol however, took one look at Lily at the train station and without even making himself known, left her waiting at the station with her suitcase. Perhaps Sol sensed something difficult about Lily, something more complicated than he was ready to accept. The next day, Nathan goes to the house where Lily is staying to apologize on behalf of his family. He too, takes one look at Lily but unlike Sol, decides to marry her. Nathan is content to let Lily take her time settling in, content to wait for her to feel safe enough to tell him her story. The mystery of his bride’s past doesn’t daunt him but even as Lily herself wonders when she can slip into the security of her new life, her stolen name threatens to reveal itself. Lily Azerov is not the real Lily, who is dead, and whose diary she carries, whose identity papers she used to escape, whose death gave her a new life. One day, the false Lily leaves the house to buy milk, taking only her handbag. She vanishes, leaving behind her husband Nathan and three-month-old baby Ruth. Growing up, the only communications Ruth receives from her missing mother are eccentric birthday packages which arrive at erratic intervals, each one containing a small, beautiful rock, labeled with a date and the name of the place where the rock was found. There is no return address, but the packages can only have come from Lily. None of the Kramers talk about Lily; there is no blame or curiosity attached to her whereabouts, at least not in front of Ruth. Nathan does not go looking for her and by the time Ruth finally does, she is the mother of three children who want to know about their beautiful, unknowable grandmother. The Imposter Bride mesmerized me from start to finish, with its beautiful, controlled prose that swings the reader seamlessly between Jewish Montreal to the bleak wreckage of wartime Europe. Richler describes a post-war immigrant community determined to live a blessedly mundane life, a community that understands how each person must walk a different path to cope with loss. Some settle into the comfort of an ordinary existence while others need to put more distance between themselves and their memories. Although she has fled as far as Montreal, it turns out this is not far enough for the Lily. Richler never hands us Lily’s entire story, only the barest outlines of her movements during the war, scraps of memory, and brief observations from other characters. More telling than any outright narrative, Lily’s unspoken past hints at tragedies the Jewish community knows all too well, too painful to tell. We understand in the end, as Ruth does, that Lily’s act of abandonment was both an act of survival and love. My own writing pretty much follows a straight sequenced narrative, mostly because I lack the skill to play with flashbacks. I’ve been trying to figure out how Richler interlaces so many strands of time and place without leaving me confused about where I am in the chronology of the story. Within the first chapter we learn how Lily Azerov came by her identity papers, and by the second chapter we know she walks out on her family, and we keep on reading, waiting for answers that emerge gradually, through scenes that overlap ever so slightly, seen through different eyes, connected to earlier episodes. There are segments about Lily and her life in Montreal. There are Ruth’s childhood memories. We share fragments of everyone's past: Ida Pearl, the jeweler, who is cousin to the real Lily; her daughter Elka, who marries Sol; Bella, the Kramer matriarch. Every chapter moves through several different times or points of view, seemingly at random, yet the story always feels anchored. At first I thought that Richler managed this through point of view: Ruth’s narratives are in the first person, her chapters crisscrossing from childhood to university, while the other chapters are written in the third person. Yet this chapter-by-chapter differentiation through point of view does not suffice to keep the story line under control. A chapter might begin with Lily, transition to her time in Palestine, and close with an excerpt from the dead girl’s diary; or a chapter might start on the evening of Sol’s first date with Elke, then on to Ida Pearl’s letter that warns her about the false Lily, all the while shifting seamlessly through snippets of family history on both sides. Now I see that Richler makes sure we don’t get lost by closing the loop and finishing each chapter back where it started. Each chapters is like a pendulum, oscillating in widespread arcs of narrative. For example, the novel begins with Nathan and Lily’s wedding, followed by a flashback where we learn more about Lily as she strips the dead girl of a diary, a diamond, and an identity card. We return to scenes at the wedding, where Sol recalls and regrets how he walked out on Lily at the station. At the wedding also are Ida Pearl and Elka, the older woman there to see whether the bride is her cousin Lily; there is Nathan’s mother Bella, watching the wedding and thinking back on her own marriage. Then in the second chapter, a small, beautiful rock arrives for Ruth’s birthday, and this event naturally leads to an account of how Lily vanished. But the arcs gradually diminish in amplitude so that by the end of the book the pendulum is stilled. There is a chapter composed of a single pivotal scene about Lily that offers a reason for her disappearance; then follows a chapter of chronological narrative about Ruth’s search for her mother. In chapters where memories intrude, we are returned at the end to the time, place, situation or theme that started the chapter. This, and Richler’s masterful, seamless transitions are what keep the story line under control and the reader anchored. At the moment, I can only conceive of structure in terms of plot. This book has helped me better understand another dimension to structure, which in the future I will try out to add more texture to my writing. For now I think I”ll just work on seamless transitions -- and try to remember about the closed loop approach to handling flashbacks. This is another of the shortlisted books for this year's Giller Prize. The bride in question is a Jewish woman who has fled Europe in WW2, and has eventually arrived in Montreal, to take part in an arranged marriage. As soon as her betrothed lays eyes on her, he rejects her, to his everlasting regret, because his brother steps in and does what needs to be done. But Lily Azerov is not who she claims to be, and soon after her daughter is born, she abandons her family. This story is told from multi This is another of the shortlisted books for this year's Giller Prize. The bride in question is a Jewish woman who has fled Europe in WW2, and has eventually arrived in Montreal, to take part in an arranged marriage. As soon as her betrothed lays eyes on her, he rejects her, to his everlasting regret, because his brother steps in and does what needs to be done. But Lily Azerov is not who she claims to be, and soon after her daughter is born, she abandons her family. This story is told from multiple perspectives but mostly from that of the daughter as she grows up struggling to understand the absence of a mother, and then trying in vain to understand how a mother could leave her child. The mother leaves behind only a few enigmatic clues and a trail of stones over the years. I read Nancy Richler's second book a long while ago, and I don't remember being impressed. Years down the line, I remember virtually nothing about it. When this came along on one of my lists of Globe & Mail bestsellers, I was ready to give it a chance, but wasn't really expecting much. I was wrong. This is a huge leap forward from Your Mouth is So Lovely, and The Imposter Bride had me in its quiet palm. Note: The rest of this review has been withheld due to the changes in Goodreads policy and I read Nancy Richler's second book a long while ago, and I don't remember being impressed. Years down the line, I remember virtually nothing about it. When this came along on one of my lists of Globe & Mail bestsellers, I was ready to give it a chance, but wasn't really expecting much. I was wrong. This is a huge leap forward from Your Mouth is So Lovely, and The Imposter Bride had me in its quiet palm. This book has a promising beginning. It is 1946, and Lily Azerov has come to Montreal to meet Sol Kramer for an arranged marriage; they have never met. Upon seeing her get off the train, Sol has a change of heart, but his brother Nathan likes what he sees, and steps up to takes Sol’s place. Lily doesn’t adjust well, in spite of Nathan’s and even Sol’s infatuation with her. (Sol regretted his actions almost immediately.) Lily is like someone haunted, and spends most of her time alone and closed aw This book has a promising beginning. It is 1946, and Lily Azerov has come to Montreal to meet Sol Kramer for an arranged marriage; they have never met. Upon seeing her get off the train, Sol has a change of heart, but his brother Nathan likes what he sees, and steps up to takes Sol’s place. Lily doesn’t adjust well, in spite of Nathan’s and even Sol’s infatuation with her. (Sol regretted his actions almost immediately.) Lily is like someone haunted, and spends most of her time alone and closed away in her room. When the daughter that Lily has with Nathan is just three months old, Lily disappears, leaving a note to say she is sorry. No one hears from her again until the daughter, Ruth, turns six. At this point, in April of 1953, Ruth picks up the main narration of the book, beginning when she receives a strange birthday package that the rest of the family agrees is from her mother. The story then proceeds with alternate narrators. Most of the time we follow Ruth as she grows up, trying to deal with the emptiness of having a loving extended family, yet knowing her own mother walked away from her. Over the years she gets a few more packages from her mother (albeit unsigned); they always contain rocks and a notation about their provenance. But no one really knows what happened to Lily, any more than why she left. Lily even takes a turn as one of the narrators, although we still don't learn much from her except that the experience of the Second World War caused her a great deal of pain and guilt. Without knowing the details, her story just didn’t elicit any sympathy or compassion in me for her. As the years pass, Ruth finally gets closer to the truth and finally has the opportunity to find out everything, but declines to pursue all the answers. (And why she doesn't is a bit of a mystery, since she spent her whole life wondering these things.) We are given a lot to think about instead however, such as what the nature of love is, and about the ways in which love and the forms it takes help define the nature of the self. This latter point is the most crucial to this story: the kind of love that means the most to you and the role it plays it your life can show more about who you are and what you need that anything else you say or do. Discussion: Apparently the opening premise is similar to what happened to the author’s grandmother, who came to Canada from Eastern Europe expecting to marry a man who rejected her upon her arrival. It serves well as a story arc, but would work much better if we ever got even the slightest idea of who some of the characters are as people. There aren't many characters, and so it is particularly unsatisfactory that we come to know so little about them. Who are Sol and Nathan and why do they react the way they do? What about Sol's future wife, on whom it fell to raise Ruth? The author doesn't tell us much at all. We get a little more information about the mother of Sol and Nathan and about Sol’s future mother-in-law. As for Ruth’s birth mother, we end up knowing hardly more about her at the end of the book as we did in the beginning. It left me feeling disappointed, as if I had wanted stew and had to settle for broth. Evaluation: There are some big gaps in the major plotline, oddly combined with the inclusion of some rather elaborate minor plotlines that are dead-ends, i.e., neither really going anywhere nor contributing much to the story. Nevertheless, it is a compelling read, and it was shortlisted for the 2012 Scotiabank Giller Prize, Canada’s most distinguished literary prize for the best Canadian novel or short story collection published in English. I read this mostly because it was shortlisted for the Giller prize, and I try to make a habit of reading the five nominees before the winner is announced. There was so much I enjoyed about this book, but it somehow lacked the punch I would have expected from a prize finalist. Perhaps it's just my own expectations, but it felt like I was reading a book from twenty years ago rather than a 21st century novel. Perhaps it's just having somebody with the last name of Richler writing about the Jewish co I read this mostly because it was shortlisted for the Giller prize, and I try to make a habit of reading the five nominees before the winner is announced. There was so much I enjoyed about this book, but it somehow lacked the punch I would have expected from a prize finalist. Perhaps it's just my own expectations, but it felt like I was reading a book from twenty years ago rather than a 21st century novel. Perhaps it's just having somebody with the last name of Richler writing about the Jewish community in postwar Montreal (Mordecai is apparently the author's second cousin). But there were also many times where it seemed like the author wanted to write with modern sensibilities, yet constrained herself at the last moment. As one example, there were a few places like where everything seemed to point toward some revelation of a minor character being homosexual. I was actually skimming the lines at points to get to the foregone conclusion, so certain was I of the fact. Yet it never materialized. It's not something I was actively seeking, or wanting to read into the book. The set-up was honestly just begging for the answer, and things seemed to fall flat when it was nothing so scandalous (not to mention obvious). When homosexuality is finally brought up, it is so after the fact, irrelevant and not even hinted at that the reveal was anticlimactic and meaningless. I was also jarred by the transitions in the book. Often I had to temporally reorient myself at the beginning of a chapter as no dates were given to the reader. This was especially difficult when a chapter began or ended with a journal excerpt rather than a dateable story element. There was also a fair amount of midstream character flipping, where the narration went suddenly to another person's point of view without any warning. The Imposter Bride is a very character-driven book. It begins in post-war Montreal with the arrival of Lily Azerov, a refugee from Poland who has come to marry Sol Kramer. When Lily disappears one day, deliberately abandoning her three-month-old daughter and husband, it causes a break in the family's psyche that comes to define that era of their lives and the decisions they make after. In many ways, The Imposter Bride is a novel about mothers and daughters. Ruthie, the a Originally reviewed here. In many ways, The Imposter Bride is a novel about mothers and daughters. Ruthie, the abandoned three-month old, spends most of the novel trying to understand her mother or quantify her absence. The novel moves backwards and forwards through time, and the reader sees that Lily didn't have a great relationship with her mother either. It's like a family cycle, the distance amplifying with each new generation. Another significant mother-daughter relationship is that of Bella and Nina. Bella is the mother of Sol and Nathan, and Nina is her only daughter. The differences between them tend to represent the old and new worlds. Bella is traditional, a practical housewife, the angel-in-the-corner. Nina is free-spirited, dramatic, occasionally promiscuous, and aspires to become an actress. The two women don't understand and often disapprove of each other. The most explosive of the mother-daughter relationships would have to be the one between Elka and Ida Pearl. Sent to Canada as a means of exile, Ida Pearl is a self-made woman who raised Elka without the help of any man or extended family. In many ways she has hardened herself to the pain of life, and when Elka enters her teens, putting on "histrionics" as Ida calls them, Elka feels belittled by her mother's lack of sympathy. Despite everything that Ida has sacrificed to raise Elka, Elka still feels the alienation of growing up in a non-nuclear family with a hard-hearted mother. It influences the way she seeks out relationships, and eventually the way she parents her own children. This is the engrossing and highly readable story of "Lily Azerov" who has fled Eastern Europe after the turmoil and horror of the Second World War. In Palestine, she makes arrangements to marry a Canadian Jew, Sol Kramer, who, on sight intimates the damage behind her calm demeanor. Sol quickly and shamefully decides not to marry Lily, but his brother Nathan does. Ida Krakauer and her teenaged daughter, Elka, show up at Nathan and Lily's wedding uninvited. Ida has heard from her sister Sonya in T This is the engrossing and highly readable story of "Lily Azerov" who has fled Eastern Europe after the turmoil and horror of the Second World War. In Palestine, she makes arrangements to marry a Canadian Jew, Sol Kramer, who, on sight intimates the damage behind her calm demeanor. Sol quickly and shamefully decides not to marry Lily, but his brother Nathan does. Ida Krakauer and her teenaged daughter, Elka, show up at Nathan and Lily's wedding uninvited. Ida has heard from her sister Sonya in Tel Aviv that a young woman has recently been there posing as their cousin Lily. Ida determines, like Sonya, that Lily is indeed no relation of theirs, but someone who has assumed a new identity in an attempt to escape the trauma and horror of her war experience. Lily, apparently fearing exposure by Ida, flees Montreal, her marriage, and her three-month old child, though Ida, a self-made jeweler and gem cleaver with her own painful past has no intention of calling her on her assumed identity. The book largely focuses on the growing determination of Lily's daughter Ruth, who has grown up motherless, to find her mother and uncover the secret of her past. All she has to go on are the beautiful rocks her mother has sent her at irregular intervals over the years since Ruth was six, an uncut diamond, and Lily Azerov's journal, which was appropriated by the "imposter bride" somewhere along the way. I'm not sure what I expected when I picked this book up. I guess I expected some sort of a variation on the tale of one woman tricking a man into marrying her in guise of someone else. But, that's not what this story is at all. Well, I guess it kind of is, but it's so much more than that. While reading this book I felt profoundly sad. Mostly because of the circumstances from which many of the characters came from - WWII. Many of them being refugees who were some from post traumatic stress disorde I'm not sure what I expected when I picked this book up. I guess I expected some sort of a variation on the tale of one woman tricking a man into marrying her in guise of someone else. But, that's not what this story is at all. Well, I guess it kind of is, but it's so much more than that. While reading this book I felt profoundly sad. Mostly because of the circumstances from which many of the characters came from - WWII. Many of them being refugees who were some from post traumatic stress disorder - even though such a term hadn't yet been coined. There was a scene that sums this experience up quite succinctly. It occurs relatively near the beginning of the novel when Ruth was in school. Her teacher does his best to keep his past from poisoning his present but, on this particular day, his best attempts fail him and he silently cries in front of his class. This event changes Ruth forever - it changed me forever as well. Nothing provoked such a reaction and yet, he was clearly reacting in response to unseen forces. He had traveled across the ocean to escape what tormented him but it followed him, psychologically. Have you ever picked up a book and almost felt like it was alive...I could tell the moment I picked up this book that it was full of emotion. I had apprenhension about reading because I could feel the sadness pouring from this book. It was one of those books that the mystery kept enticing you on ... right to the last minute. I wasn't initally sure I loved this book until I came to the end... and at the end I realized how captivating the story was and how much I loved reading it. Sorry, but there was not enough story to encourage me to continue reading to see what the big mystery was. The POV/time switches were very jarring and distracted from the reading experience. I began to lose track of who was who and what time frame we were in. Would have worked better from the daughter's POV and covered her early years by backtracking instead of all the endless daily happenings. This is a surprisingly complex novel whose central theme is identity and how it can be compromised by a variety of actions. Lily Azerov is not actually Lily Azerov, but a Polish imposter who has assumed her identity in the chaos following WWII, with borders being redrawn, chaotic infrastructure, and the overwhelming grief experienced by Holocaust survivors (grief not only at the loss of entire families, but survivor grief and guilt as well). Short-listed for the Giller in 2012, I'm not surprised This is a surprisingly complex novel whose central theme is identity and how it can be compromised by a variety of actions. Lily Azerov is not actually Lily Azerov, but a Polish imposter who has assumed her identity in the chaos following WWII, with borders being redrawn, chaotic infrastructure, and the overwhelming grief experienced by Holocaust survivors (grief not only at the loss of entire families, but survivor grief and guilt as well). Short-listed for the Giller in 2012, I'm not surprised this one didn't win. The first half of the novel is extremely confusing in a way I can't tolerate: we have three different narrators, none of whom are really clearly delineated for the longest time: the real Lily (via a notebook); fake Lily; and fake Lily's daughter. The second half improved significantly, but I think that may have been too late for many readers. I understand some novels have to be approached like Impressionist paintings, that they will suffer if you don't let yourself just experience the words and subjugate your need to know their meaning (or even their true relation to the plot) till later in the novel. But I don't think that's what's going on here - I think the novel's flaws are those of structure and characterization. I also think it could have been a lot shorter and a lot tighter. ATTENTION: If you are in a bookclub, this is a book for you!! Perfect for a round-table discussion. I just love when I go into a book, knowing nothing about it, and page after page I am drawn deeper and deeper into its awesomeness. This book did just that. I swallowed it hook, line and sinker. The title character is one of the most intriguing characters I have read in a long while. No matter how much I learned about her, there was even more that was left to the imagination. Every time Richler gave ATTENTION: If you are in a bookclub, this is a book for you!! Perfect for a round-table discussion. The title character is one of the most intriguing characters I have read in a long while. No matter how much I learned about her, there was even more that was left to the imagination. Every time Richler gave her readers a little hint to Lily's (the Imposter Bride's) identity, she gave two more pieces of mystery to shroud her identity. I was utterly captivated. I also liked how the story was structured, flipping back and forth between timelines and POVs. I particularly enjoyed the chapters that were from Lily's daughter's perspective, in which she receives strange, rock-filled presents in the mail and she tries to decipher their meaning in hopes of being re-united with her estranged mother. A gorgeous depiction of Montreal's post-war streets and neighbourhoods, I was absolutely not surprised to learn that Nancy is Mordecai's cousin. There is definitely a strong family resemblance in the locations and their descriptions in their novels. Written with such a lithe, flowing language, I found this book difficult to put down. It was just so readable and enjoyable. A pure pleasure. This should have been a five star read. The story was stellar. During WWII a woman comes across a dead girl and steals her documents and becomes her. She then goes to Canada to marry only to be left at the train station by her intended, Sol. Sol's brother ends up marrying her. She has a daughter, Ruth, and after 3 months goes out for milk and never comes home. Most of the story is told via flashback of the woman who became Lily and the family she married into. The present day chapters mostly con This should have been a five star read. The story was stellar. During WWII a woman comes across a dead girl and steals her documents and becomes her. She then goes to Canada to marry only to be left at the train station by her intended, Sol. Sol's brother ends up marrying her. She has a daughter, Ruth, and after 3 months goes out for milk and never comes home. Most of the story is told via flashback of the woman who became Lily and the family she married into. The present day chapters mostly concern Ruth's growing up years trying to understand her abandonment by her mother. The title is deceptive because this isn't Lily's story, this is her daughter's story; which is fine except the novel isn't much of an identity story either. Character development was sluggish and inconsistent, the title character was rather disappointing and not nearly as developed (nor unfortunately, as interesting) as other characters were. I left not entirely satisfied with character motivations, though I wonder if this was an intentional effect of the nature of the narrative. I didn't have a The title is deceptive because this isn't Lily's story, this is her daughter's story; which is fine except the novel isn't much of an identity story either. Character development was sluggish and inconsistent, the title character was rather disappointing and not nearly as developed (nor unfortunately, as interesting) as other characters were. I left not entirely satisfied with character motivations, though I wonder if this was an intentional effect of the nature of the narrative. 3.5 stars. I liked the mystery surrounding the enigmatic Lily Azerov, immigrating to Canada as a bride-to-be from war-torn Europe. We soon know she is not the woman named on her papers, but who is she? Much theorizing and discussion ensues on that subject after the woman leaves her husband and new baby girl without explanation. The relationship of the family that remained behind was very unusual and special. Underlying the narrative is the theme of how Jewish families were able to move forward a 3.5 stars. I liked the mystery surrounding the enigmatic Lily Azerov, immigrating to Canada as a bride-to-be from war-torn Europe. We soon know she is not the woman named on her papers, but who is she? Much theorizing and discussion ensues on that subject after the woman leaves her husband and new baby girl without explanation. The relationship of the family that remained behind was very unusual and special. Underlying the narrative is the theme of how Jewish families were able to move forward after the war. The chapters written from the little girl’s perspective were my favorites. But the story moved too slowly in other parts; and once we learn more about Lily, I really wanted more. There were still unanswered questions at the end. This book is an example of why I only read female authors. Ms. Richler weaves a complex story of female trauma in an engaging fashion. Thank-you for this work. The Imposter Bride refers to one of the characters who survives the Holocaust and makes her way to Montreal using id she stole from a dead girl. Her secrets aren't safe though and she leaves her infant daughter with her husband and disappears. The story then continues through the eyes of her daughter alternating with flashbacks to Lily's past. I enjoyed the meditative journey through this family's history. While I do not regret reading The Imposter Bride, I feel as though I need to warn people about several disappointing aspects. For one, I found about a fourth to a third of the novel to be utterly disinteresting. I knew from reading the description that I was going to read a character-based book, not a plot based one, but certain parts were ridiculous. I suffered through pages of scenes only somewhat related to the plotline, or even the arcs of main characters. Perhaps the problem was that I simp While I do not regret reading The Imposter Bride, I feel as though I need to warn people about several disappointing aspects. For one, I found about a fourth to a third of the novel to be utterly disinteresting. I knew from reading the description that I was going to read a character-based book, not a plot based one, but certain parts were ridiculous. I suffered through pages of scenes only somewhat related to the plotline, or even the arcs of main characters. Perhaps the problem was that I simply didn’t care about many of the characters, but I blame the book for having too many minor characters with ludicrously long sub-plots. The rest of my criticisms contain spoilers, so I will talk about what I enjoyed before I continue my rant. I enjoyed the time frame of the Imposter Bride. I’ve read many books about World War II, yet few on life shortly afterwards. Reading about how Jews forced themselves to keep on living when literally everyone they loved was dead was both captivating and heartbreaking. The novel alternates in time between when Lily arrives in Montreal and the time frame in which her daughter grows up. This is initially extremely confusing and requires patience. However, the rapid flow between before and after Lily disappeared adds to the suspense at the end of the novel. I also liked how this book was a pleasant mix of several genres. The setting fulfilled my desire for historical fiction, while a collaborative combination of romance and mystery was added. Unlike several books I have read (such as Mistress Shakespeare), I was convinced that The Imposter Bride knew exactly what it wanted to be and how it was going to do so. Back to my rant. Why did Lily leave? It was never explained properly. Ruth spends her entire life missing her mother and when the two are finally reunited absolutely no enlightening is done. I refuse to accept that Ruth just accepts that Lily can never fully justify her actions. I felt cheated when I finished the novel. The whole reason for picking this book up has never emerged. As I have mentioned in many of my other reviews, I can forgive a slow beginning (this one wasn’t slow per say, just a bit discombobulated), but never an unsatisfying ending. I am glad I read The Imposter Bride, but would by no means read it again. In my opinion, it is recommended for those who don’t mind unsolved mysteries, enjoy this sort of historical fiction, or have grown up missing a certain family member. Nancy Richler was a Canadian novelist. Born in Montreal, Quebec in 1957, she spent much of her adult life and career in Vancouver, British Columbia before returning to Montreal in the early 2010s. Richler published her first novel, Throwaway Angels, in 1996. The novel was shortlisted for an Arthur Ellis Award for Best First Novel. Her 2003 novel Your Mouth Is Lovely won the 2003 Canadian Jewish Boo Nancy Richler was a Canadian novelist. Born in Montreal, Quebec in 1957, she spent much of her adult life and career in Vancouver, British Columbia before returning to Montreal in the early 2010s.